According to CMS-India Corruption Study 2018 (CMS-ICS), 75% of households across 13 states in India have the perception that the percentage of corruption in public services has increased in last 12 months. 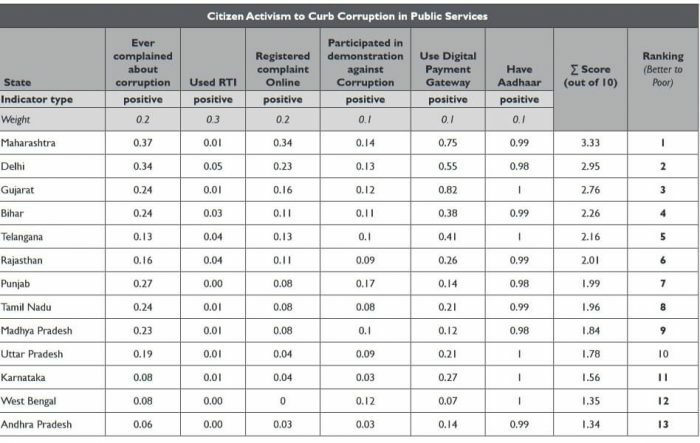 CMS-India Corruption Study is in its 19th year, and the survey has been carried with the focus on basic public services, citizens activism and the use of ICT. The survey covered more than two thousand households from 13 states including, Andhra Pradesh, Gujarat, Madhya Pradesh, Punjab, Karnataka, Uttar Pradesh, Telangana, West Bengal, Delhi, Tamil Nadu, Bihar, Rajasthan and Maharashtra. For CMS-ICS 2018, 11 public services including PDS (Public Distribution System), Electricity, Health/Hospital, School Education, Water Supply, MGNREGS (Mahatma Gandhi National Rural Employment Guarantee Scheme), Banking Services, Police, Judiciary, Housing/Land records and Transport service has been covered. The data collection for CMS-India Corruption Study 2018 was conducted during February-March 2018. States like Kerala, Haryana and Himachal Pradesh has not been included in CMS-ICS 2018 due to their better performance in previous year CMS-India Corruption Study. This is the 19th year of CMS-India Corruption Study, and the survey has covered both rural and urban locations of 13 states and 11 public services. In CMS-ICS 2018, 75% of households have the perception that corruption in public services has increased in last year. 27% of households have experienced corruption at least once while availing any one of the 11 public services mentioned above. While comparing with 2015, households experiencing corruption while availing the public services has come down by almost half-from 52% to 27%. 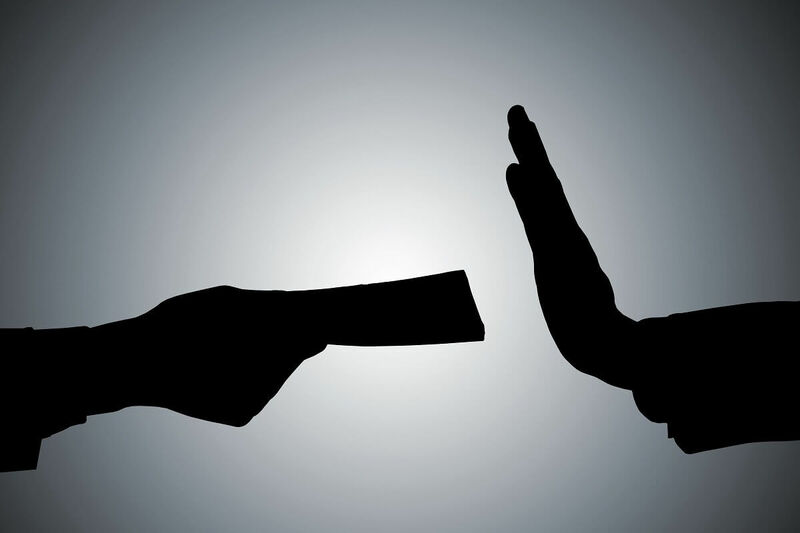 Among 13 states, 73% of households in Telangana, 38% in Tamil Nadu, 36% in Karnataka, 35% in Bihar, 29% in Delhi, 23% in Madhya Pradesh, 22% in Punjab and 20% of households in Rajasthan have experienced demand for the bribe to access the public services. 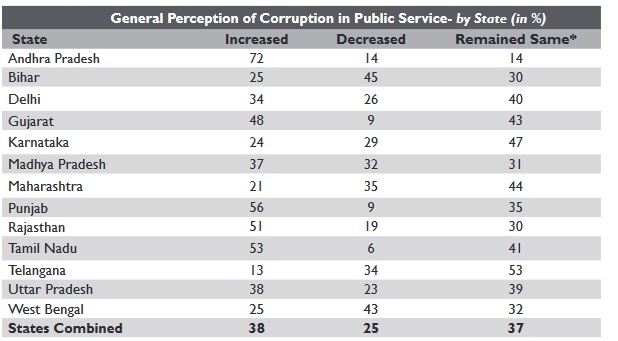 Among 11 public services, the households experiencing corruption includes Transport (21%), Police Service (20%), Housing/land records (16%), Health Services (10%) and banking services (less than one percent). Among 99% of the respondents had Aadhaar, but out of them, 7% of the respondents had paid a bribe to get it, and 3% of the respondents (in 92% of respondents) had paid the bribe to get the Voter ID. Perception about Union Government’s commitment to reduce the corruption in public services has been dropped from 41% (2017) to 31% (2018). The reasons for paying bribe continues to the same primary services such as get/renew driving license, registering a complaint, getting PDS/ration card, school admission, inflated bills correction and much more. States like Delhi, Maharashtra and Bihar are perfect examples of citizen activism in increasing public service and reducing corruption in availing public services. 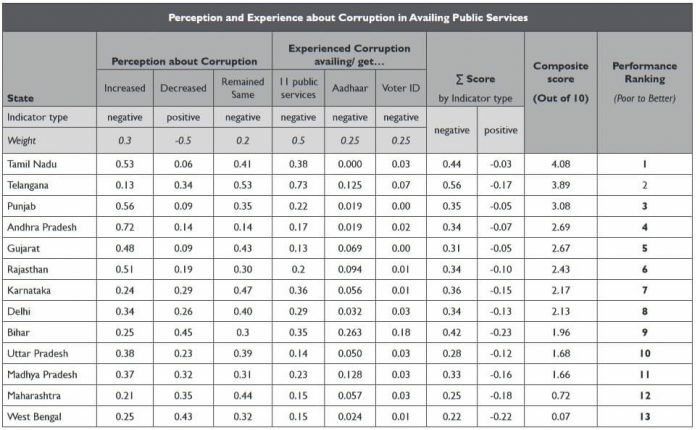 Among 13 states, people’s perception and experience with the Corruption while availing the Public services put Tamil Nadu in the first position. Among 13 states, Tamil Nadu, Punjab, Telangana, Andhra Pradesh, Gujarat and Rajasthan are categorised as Poor Performing states. While West Bengal, Maharashtra, Madya Pradesh, Uttar Pradesh and Bihar are categorised as better performing states. On the Use of RTI, online complaint registering, Use of Digital Payment Gateway, participation in public protest rally against corruption – Maharashtra, Delhi, Gujarat, Bihar and Telangana are categorised as better performing states, while Andra Pradesh, West Bengal, Karnataka, Uttar Pradesh and Madya Pradesh are categorised as Poor Performing states.